It's been a lazy day with much to show for it. I've nearly finished a new essay, watched a ridiculous amount of TV (TNG, Gilmore Girls, Keeping Up Appearances, and Brave), and have two full days of leisure still ahead of me. Well, if you don't count the laundry and our promise to clean and unpack the last few boxes that are gathering dust in the apartment on Monday. The radiator is whistling and tinkling again. I love that sound. It makes me feel warmer just hearing it. 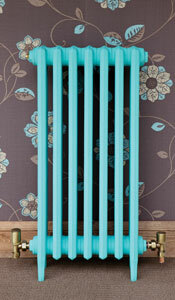 I wish our radiator was as cute as the picture I found, but that one probably isn't nearly as warm as ours. One of Tom's recent Facebook posts was: "Keep trying to remember to notice the wind on my face and the ground beneath my feet." I'm trying to keep that in mind myself these days. I want to appreciate what I have, whether I'm out and about or at home. I appreciated my shower more this morning than I had in a long time. Maybe it was because I'd not taken one in a few days, but the sense of the water and smell of the soap nearly shocked me to tears. It was a pleasure to just feel the heat run through each strand.